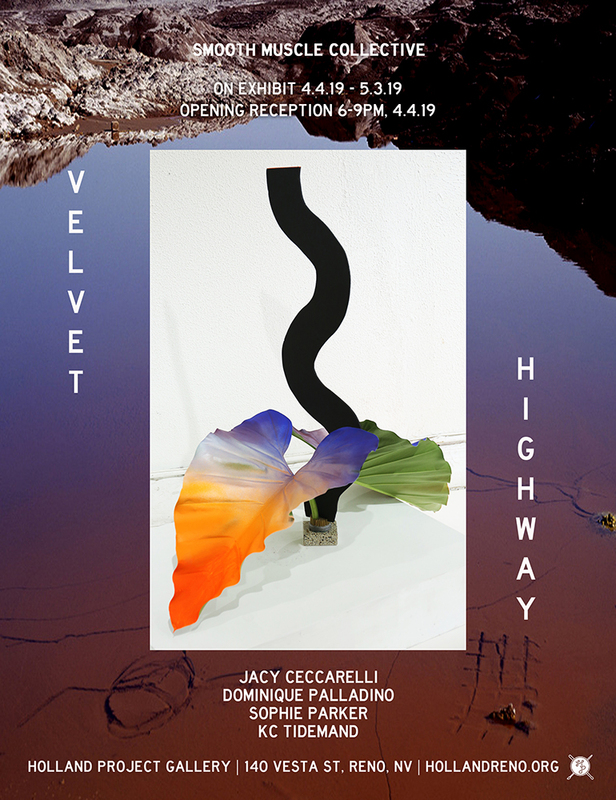 The Holland Project Gallery is very pleased to announce VELVET HIGHWAY, an exhibition of work by artists of Smooth Muscle Collective (New York + Bay Area) including Dominique Palladino, Jacy Ceccarelli, Sophie Parker, and KC Tidemand. This all women show illuminates the relationship between human, nature, and modernity. The highway is a portal to internal and external landscapes, but it is also a barrier that separates us from our wildest tendencies to wander. It is the modern ribbon connecting the wilderness to the twinkling metropolis and the visceral to the touchable. A clean, fast line cutting through the unperceived – it is the edge, an end, and a beginning. Through sculpture, photography, kinetics, and multi media, Smooth Muscle approaches the highway as a measure of internal trajectory and travel – as a metaphor for growth in the act of becoming. In the Velvet Highway, they are the drivers on the ontological road, vacillating between what it means to be neither here nor there, but rather somewhere in the middle – somewhere soft to touch. Dominique Palladino (b.1984) is a multidisciplinary artist with a focus on installation, performance and textile work. Palladino received her Bachelor of Fine Arts degree from the University of Nevada, Reno, where she was raised in observance of the beautiful desolation of the Mojave desert and its spiritual significance. Her catholic upbringing juxtaposed with her mothers spiritual renunciation of the material world influenced and shaped her work into the feminist-centric advocacy it is today. In 2015 she received her masters from the School of Visual Arts in New York City where she lives and works today. Palladino is a founding member of Smooth Muscle, as well as the founder of Cunty, an empowered fempparel movement that aims to reclaim the word Cunty back to its original state of reverence. Sophie Parker (1987, based in Brooklyn) is a painter and installation artist that frequently exhibits her work throughout New York City. Born in the Ozark Mountains, Parker often draws from her roots in the land as a point of contrast in the urban experience. She is a founding member of the Bushwick’s Fruit Exchange Studios, as well as the founder of Wife—the internationally acclaimed art, design and floral studio. In a recent book by Phaidon, Parker is prominently featured as one of the 40 most influential floral artists in the world. Sophie Parker’s hand-painted botanical sculptures question the very definition of “natural.” Exploring the terrain between the organic and the manmade, Parker approaches the plant kingdom as a dynamic medium and often refers to her pieces as a new, hybrid species. Her whimsical sculptures foreshadow a biological future in which the natural and the synthetic are deeply entangled. Her botanical interventions introduce a questionable origin story to the species – one that interjects the human hand in to the biological equation. KC Tidemand (b.1988) is a Norwegian visual artist. She received her Masters in Fine Arts from the School of Visual Arts in NYC in 2015 and her Bachelor’s degree in Fine Arts and Philosophy from Skidmore College in Saratoga Springs, NY in 2011. Tidemand has exhibited throughout New York City and, but not limited to, Satellite Art Fair Miami, Vivid Spaces in San Diego, as well as Tang Museum, Saratoga Springs, NY. International group shows include QB gallery and Ramfjord gallery in Oslo and Festiviteten in Eidsvold, Norway. Tidemand is also a founding member of Smooth Muscle Collective and the creator of La Kawaii, a wearable art line consisting of hand painted vintage leather pieces. She is currently living and working in New York City. Jacy Ceccarelli was born and raised in Reno, NV. She moved to Boston, Mass to attend Emerson College where she received her Bachelor of Fine Arts in Creative Writing and a Bachelor of Arts in International Development in 2008. She has been working in fashion since 2010 as a founder, creative director and stylist for multiple brands. Based in NYC, her newest project is Trouble Muffin, an eco-fashion line. VELVET HIGHWAY will be on view from April 4-May 3, 2019 with an artist reception on April 4, 6-8PM. The HP Main Gallery, Hallway Gallery and Serva Pool Gallery are all located at the Holland Project at 140 Vesta St., Reno, NV. Gallery hours are 12-6pm Wed – Fri and every last Saturday of an exhibition. Appointments can be made with Alisha by emailing alisha@hollandreno.org or calling 775-448-6500. To see what came before in the Holland Project Galleries, check out PAST EXHIBITS. To find out what’s up next, check out UPCOMING EXHIBITS.